Fall/Winter 2018 GRO Skateboard Program. Thursdays. 5:00 – 7:00 PM. $5 Suggested Donation Per Rider. 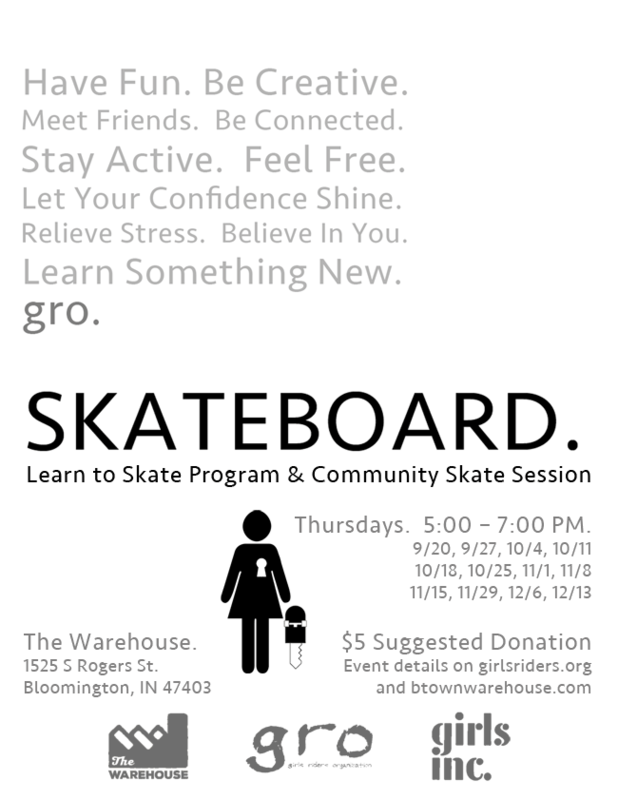 This is an open skateboard session to build the participation in and the supporting community around skateboarding in Bloomington. This is a chance for anyone of any age or skill level to get involved through these events. For the first time and beginner riders (of all ages), equipment and instruction are available in learning to ride classes. Community members interested in learning to skate can participate in the open skate class from 6-7 PM. There is a $5 donation per skater for the class to help cover instruction and use of the equipment. For adults or more advanced riders, these sessions can offer an opportunity to volunteer or mentor the newer riders. GRO is an organization that runs through the help of the community. Instructors, general volunteers, photographers and more can all contribute to growing the health of our skateboarding community and it’s offering for our youth. All participants must have a waiver signed with The Warehouse. Waivers can be completed at The Warehouse or accessed online here. All participants must wear proper shoes to skateboard! No exceptions. Must have skate shoes or similar flat sole tennis shoes. No sandals, no heels, no boots, no dress shoes or open toe shoes. Safety first!